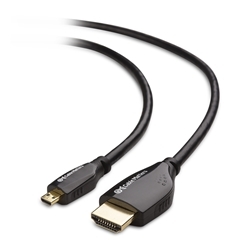 Future-proof your audio and video connection with this feature-filled Category 2 High Speed Micro HDMI cable that is capable of carrying the increased bandwidth of HDMI 2.0. It is the perfect choice for connecting smartphones and tablets to HDTVs, monitors, or projectors with HDMI input. The combination of gold-plated connectors, bare copper conductors, and foil & braid shielding provides superior cable performance. Molded strain relief connectors and easy-grip treads increase durability and make plugging and unplugging a breeze. - Supports resolutions at 4096x2160, 3840x2160, 2560x1600, 2560x1440, 1920x1200, 1080p and etc.